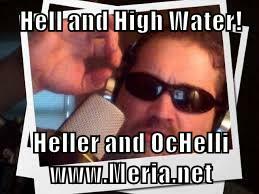 5/8/18 Hell & High Water, with Meria and Chuck Ochelli. trump withdraws from Iran deal for Israel;trump spied on John Kerry & Obama admin over it;depression on it’s way;Zionism-9/11/01-Richard Grove;Black Cube;such a thing as ex-Mossad? Oliver North, Iran/Contra criminal heads the NRA;Russian money & the NRA;inverted world; cops killing;Hawaii-where’s trump?IPhone gun?no guns at the NRA convention;NSA surveillance;Morality/hypocrisy;Sarah, dgtr of a preacher man; call a lie a LIE already, trumps up to 3,001 so far;Russia’s weaponry; theocratic rule – Biblical law on it’s way;starving the social net and much more. 2 Responses to "Hell and High Water, with Meria & Chuck Ochelli"
Although I’m pretty sure that I don’t have to tell you that I LOVE “Hell and High Water”, I’ll tell you anyway…I LOVE “HELL AND HIGH WATER”! Thank you, Meria and Chuck, for always living up to my every expectation. thanks, I love it too! hugs!